Tony arrived in style in a cream-coloured repro 1930 London taxi and this wonderful sense of style permeated the evening as he held a packed hall in the palm of his hand whilst discussing techniques to improve brain power. Tony has filled the Albert Hall and lectured to leading politicians and businssmen around the world, as well as coaching Olympic athletes, in particular rowers. And we were thrilled that he had found time in his hectic shedule to come from Marlow to talk in Wootton. Everybody was given pencil and paper for some exercises, including one for the potential use of paper-clips, to show that (through lateral hinking) they have far more uses than imagined - and this could be extrapolated to hundreds of other areas. It seemed the moral is that many things, including humans, have far more potential than imagined. Tony highlighted the phrase used nowadays when people claim to be having "a senior moment". But he pointed to many people who have reached their creative peak in their late eighties and into their nineties, such as Verdi, who composed his requiem as an octogenarian, and many conductors and architects who have done some of their best work at an advanced age. One theme pervading Tony's insightful and extremely witty talk was that we all have a vast reservoir of untapped potential, with most of us barely using one per cent of our brain's capacity - and yet we are living in the ultimate age of information technology and we are in a perfect place to expand the use of our brains and use their potential to maximum effect. To this end, Tony highlighted the technique of so-called Mind-Mapping, which allows everybody to chronicle their attributes and to expand of them as fully as possible. Tony has written or co-written over a hundreds books, which have been translated into at least 30 languages, and his broadcasts are estimated to have been heard by upwards of two billion people around the world. Some people at his talk in Wootton had travelled from South Wales for the evening, having read many of Tony's books but never having had the chance to hear him speak in person - and found themselves on the front-row, just a few feet from their hero. After his talk, all 26 copies of his book, Use Your Head, worth £392, were sold and and the evening raised £586, giving a total of just under £12,000 after twenty-two talks. How can a paperclip be used or not used?" 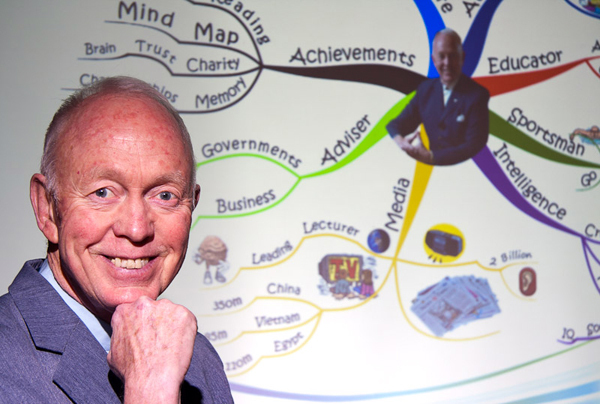 That was the question set by Tony Buzan as part of his very interesting, interactive, and entertaining talk. We all wrote furiously, but the ultimate answers were not all that we expected! Mind-mapping, he showed us, is also mind-boggling. For those of us who are chronologically challenged, the downward spiral of creativity and memory sounded dire, but Tony reminded us that we still have plenty of steam. "A senior moment", he pointed out, is not "what did I come here for?" but "I've just climbed Everest!" - John Head, Banbury.